More than a week after informing PlayStation Vita contest winners that their entries were invalid, fast food corporation Taco Bell has told them that it messed up, blaming "technical issues" for the confusion. The misled contestants, who were told they won PlayStation Vitas on or around January 30, will all enter a "separate drawing" to win the system in late March. 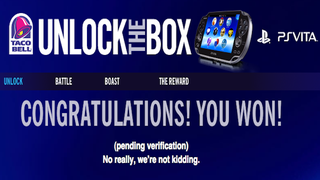 We learned that during a period of time on January 30, 2012 some people entering the promotion erroneously viewed a message suggesting they had won a PlayStation Vita, pending verification. After a thorough investigation, and an additional review by the independent company administering the promotion, it was confirmed that these entrants viewed these messages or accessed them directly as a result of technical issues created by outside attempts by others to gain illegal entry and defraud the system. Unfortunately, these entrants were not valid winners. Some of the misled contestants are not happy with this outcome. "It's one of the biggest slaps in the face that someone could ask for," contestant Jason Margraves said in an e-mail. "It's like a roller coaster — I'm at the highest point thinking that I won a 'one in a million' shot contest, even to the point where I posted on my Facebook page that 'Hey guys, I won this contest, you should do the same!' I'm just really bummed out about it." Through this contest, available at Taco Bell restaurants throughout the country, the fast food chain promised to give away a PlayStation Vita every fifteen minutes. Purchasers of the Taco Bell $5 Buck Box received codes that they could enter on the company's website. Winners were notified that Taco Bell would send them a follow-up e-mail or letter within two to three days. But these notified winners never heard back. "I think it is pathetic that they will admit that we reached the winning page by legitimate means, but refuse to give us what we were promised," contestant Steven Blumenthal said in an e-mail. "This 'drawing' has only infuriated me more." On February 10, Taco Bell told Kotaku that "a small group of people have tried to game the system" and that none of the aforementioned customers had "winning entries." On February 16, Taco Bell said it would pass along screenshots it said showed multiple people conspiring to take advantage of this contest. Kotaku has repeatedly contacted Taco Bell many times over the past few days, but as of February 22, the company has not yet sent over any of those screenshots or information. "It all just doesn't add up, you know?" contestant Dan Hill said in an e-mail. "Who would hack their system to show people they were winners, what is in it for them? What's the endgame? Are they even telling the truth? Just so many questions."